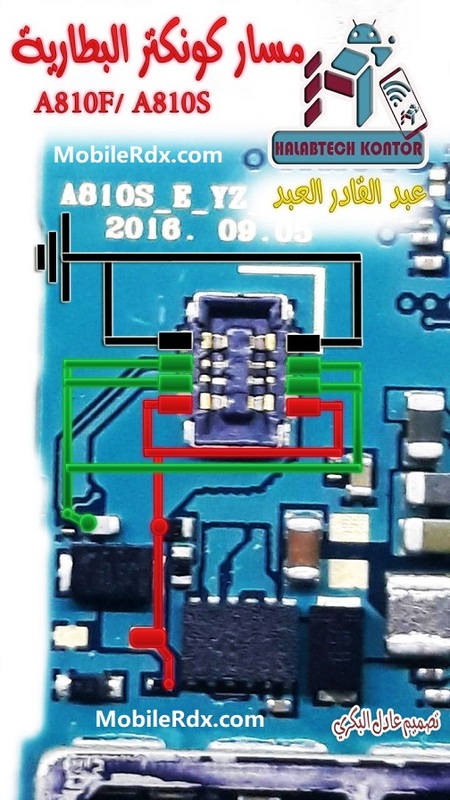 This article is about repairing solution for Samsung Galaxy A8 battery connector. If your phone’s battery connector is damaged somehow you can always replace it with a new one, but if the battery connector’s prints are damaged then the diagram in this article can be helpful to you. Damage to the battery Samsung Galaxy A8 A810F could be of the causes for the phone does get wet, padded seat battery connector corroded and rusted breaking lines. Here are Samsung A810F Battery Connector Ways Problem Solutions. Please study these diagrams very carefully before you start repairing. If Samsung A810F is not getting power ON, Replace the battery and try to power it ON. Plug in charging pin into the jack and try to make it charge. Check battery terminal’s +v and -V points with electronics meter. Disassemble the phone Samsung A810F and check battery connectors if these are loose or not fix. Then check the whole motherboard for water and rust damages, Carbon or broken parts. Find out these parts that are identified in the above diagram and make a check for volts. I find some broken parts or tracks are missing then apply jumpers as given in the above diagrams.